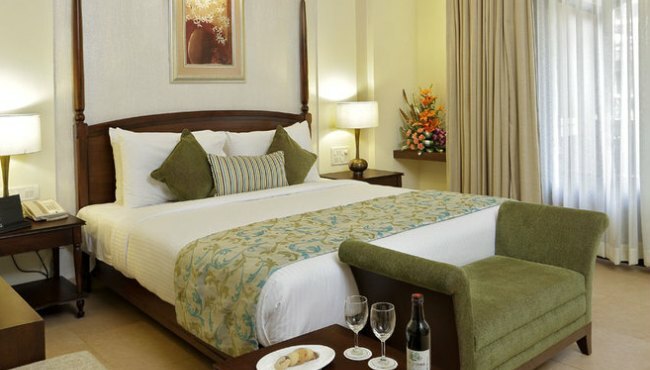 After a fun day at the beach, retreat to your comfortable hotel room or suite at the Country Inn & Suites in Candolim. Relax on plush bedding and watch your favourite shows on the 32-inch satellite LCD TV, or make a cup of coffee or tea while you surf the Web. Each room also includes a private balcony with courtyard, pool or garden views, perfect for a relaxing start to your day. A safe-deposit box is available for storing valuables, and a work desk makes it easy to catch up with emails. If you’re travelling with family or prefer added space, reserve one of the hotel’s Suites with a separate living area. Our Standard Rooms offer views of the garden and of a heritage Portuguese mansion. The rooms have a private balcony and are best suited for the traveller looking for single or double occupancy. Our Superior Rooms offer views of the lush, landscaped gardens. The rooms include a private balcony and are best suited for couples travelling with kids as well as for two or more adults sharing the room. Our Deluxe Rooms offer views of the sparkling swimming pool. These rooms feature a private balcony and are ideal for families and even couples celebrating a special occasion. Our Suites offer a spacious and modern living space. The balconies boast views of the sparkling pool and the landscaped gardens from both the living room and bedroom. A large bathroom with a bathtub and an additional powder room are also featured. A rollaway bed is included. All rooms are ideally suited for double occupancy. Our Standard Rooms offer views of the Garden and a Heritage Portuguese Mansion. The rooms have a private balcony and are best suited for the conscious traveller travelling on single or double occupancy.